The town of Gythio is perhaps best known as the place where the lovers Paris and Helen eloped from Sparta and departed by sail to Troy. The picture at left is of the lighthouse on the island of Marothonissi, to which we walked via a causeway from the main town of Gythio. Our hotel was just across the street from the waterfront. 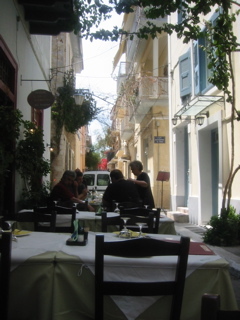 We enjoyed some memorable meals in Gythio, and enjoyed wandering the streets. 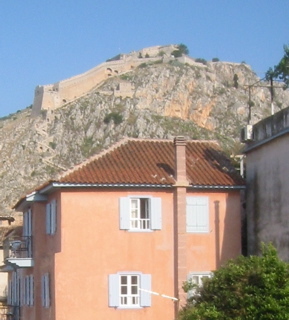 After we explored the area around Gythio, we moved on to Nafplio, where we stayed for two nights. Our favorite hotel room from the entire trip was in Nafplio. Our room was intimate and cozy and had a balcony with a view of the neoclassical city buildings down to the harbor and of the Venetian fortress of Palamidi above. In the photo to the right, you can see the view looking out from our balcony. The food throughout our trip in Greece was always great, but we had three outstanding meals in Nafplio. 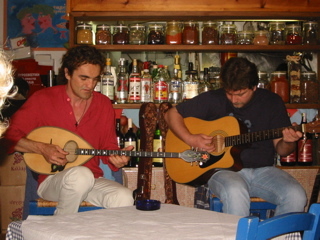 In the taverna pictured at left, we enjoyed our meals while musicians played traditional Greek music. Later, we enjoyed a meal of fresh fish on the waterfront with our group, and then we enjoyed a meal with our assistant tour guide and her mother at the Old Mansion restaurant. In all three places, it was hard to decide which was best: the conversation, the food, or the setting. This is the way to eat! Next, ancient Mycenae and the island of Spetses.